None of this is new, but I need reminding. What about you? Set goals. – Have you identified goals that align with your most deeply held values? Have you written them down? This is where an index card can help. Write them and refer to them. Be intentional and move deliberately in the direction of your goals. If you don’t care where you’re going, any road will get you there. Make sure it matches. – Before committing to a new project, check your goal list to make sure the commitment you are considering lines up with your personal or work goals. If the project fits, do you have time to add this to your queue? Keep a list your current projects and commitments. – Knowing your current load helps with decision making and managing your work. Listing all your projects helps you make wise decisions about your time and capacity. Finish – While well begun is half done, too many unfinished projects scatter your energy. Prune projects that have been languishing on your to-do list. Concentrate on the important ones. Check out 57 Things Started and Nothing Done. Prioritize – With multiple projects, what comes first? Establish a priority order to figure out the next best step. 6. Backward plan – Devise a timeline of your projects to see deadlines and other commitments. This will help you determine the precedence of your work. July 18, 2014 in Mind, Need-to-know. 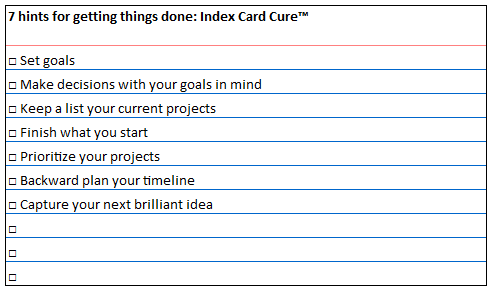 ← Close encounters with Index Cards!